Scientists at Northwestern University have developed a new nanomaterial that can “steer” electrical currents. The development could lead to a computer that can simply reconfigure its internal wiring and become an entirely different device, based on changing needs. As electronic devices are built smaller and smaller, the materials from which the circuits are constructed begin to lose their properties and begin to be controlled by quantum mechanical phenomena. Reaching this physical barrier, many scientists have begun building circuits into multiple dimensions, such as stacking components on top of one another. They have made reconfigurable electronic materials: materials that can rearrange themselves to meet different computational needs at different times. Switchable nanomaterials—materials that can change their properties and/or function in response to external stimuli—have potential applications in electronics, sensing and catalysis. Previous efforts to develop such materials have predominately used molecular switches that can modulate their properties by means of conformational changes. 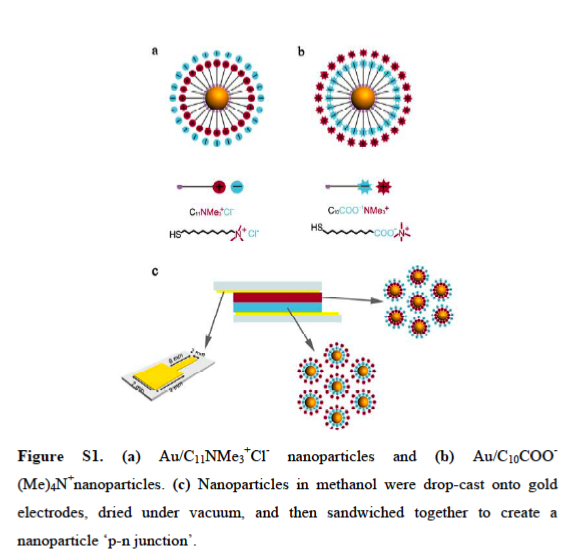 Here, we show that electrical conductance through films of gold nanoparticles coated with a monolayer of charged ligands can be controlled by dynamic, long-range gradients of both mobile counterions surrounding the nanoparticles and conduction electrons on the nanoparticle cores. The internal gradients and the electric fields they create are easily reconfigurable, and can be set up in such a way that electric currents through the nanoparticles can be modulated, blocked or even deflected so that they only pass through select regions of the material. The nanoion/counterion hybrids combine the properties of electronic conductors with those of ionic gels/polymers, are easy to process by solution-casting and, by controlling the internal gradients, can be reconfigured into different electronic elements (current rectifiers, switches and diodes).